I am a white eyed witch with a claim on magic you couldn't possibly begin to understand as a human. Long ago I made a deal with the devil, my eyes were my price. I'm loathe to tell anyone my deep secret... after all who would believe a wicked witch anyway? I wish I was the good guy... I want to be saved, or a savoir. Though that fate will never be bestowed upon me, as my calling in life has never been about the good of others. Forgive my vagueness, this is how my author wrote me up...and over the course of the Impure Books, which book 2 should be coming later this year, my plans will unravel and even I can't be certain what will happen. Want to read more about the witch? 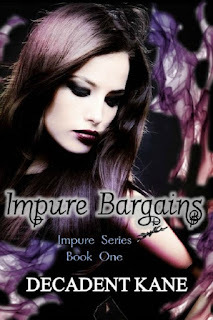 Check out Impure Bargains...though she only plays a small part in this first book.